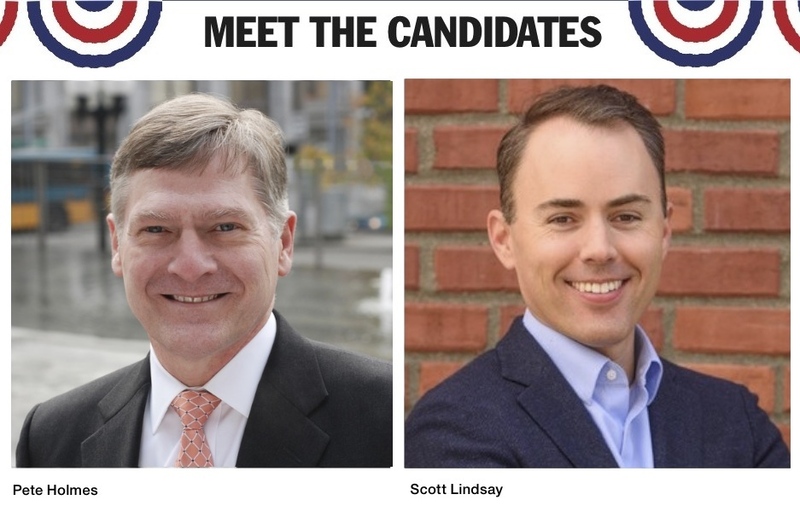 Accusations of financial carelessness, a strained relationship with police, and ineffectiveness in the courtroom have marked the contentious race for city attorney between two-term incumbent Pete Holmes and challenger Scott Lindsay. A former public safety advisor in the mayor’s office who says his campaign is focused on reforming the criminal justice system to focus on getting effective results, Lindsay has hammered home the cost of outside counsel in the attorney’s office since launching his bid in April. Those claims, he believes, have been bolstered by city Budget Director Ben Noble, who said last month that the “biggest single financial challenge we faced,” was a more than $13 million shortfall in the judgment/claims subfund, which provides the payment of legal claims and suits brought against the city. Lindsay called the relationship between Holmes and outside attorneys, “far too cozy,” and suggested that many of those hired by his office at significant rates have also supported his reelection campaign financially. “There’s something a couple clicks off here … and I don’t think that Mr. Holmes sis managing outside counsel, managing litigation sufficiently,” he said. To that end, he believes the office should have a, “robust and independent,” risk manager role to closely review those costs and to assess the potential financial risk of pursuing various cases. An example he noted was a $2.8 million verdict against the city last year — in addition to nearly $1 million paid out in legal fees — in an “egregious,” lawsuit brought by three Seattle Police officers who claimed retaliation on the part of Chief Kathleen O’Toole over their transfer from the South Precinct. Ultimately, though Lindsay said some fluctuations are expected, the reliance on outside counsel in his view has been excessive. Indeed, that’s a point of contention between the two candidates. Holmes said the judgment/claims subfund is not part of his budget, and that he’s responsible for negotiating his own law department budget each year, one he said he has never exceeded. As far as the fund itself, Holmes said the initial figure in the budget is “at best a guess,” and that over the past 10 years, the judgment claims fund has run a $35 million surplus. While city law allows for half of any surplus from one year to be rolled over to the next, Holmes said that has never occurred. In addition, Holmes says, as a result of efforts like the high-earners income tax, the $15 minimum wage, tenant protections, paid sick leave, a collective bargaining ordinance for rideshare drivers, and even the passage of Initiative 124, which gave increased protections for hotel workers, the city has been sued more times in the last year-and-a-half than in the rest of his time in office put together. Having to defend that many legal challenges is what he said is the main driver of increased costs, with only so much capacity in the office. Other cases that require outside assistance include those that deal with topics that require specific knowledge — antitrust law, for instance, on the rideshare legislation. However, Holmes said the city does what it can to limit those costs. For instance, law firm Steptoe & Johnson argued in favor of the city’s gun violence tax in front of the state Supreme Court at no cost, while Pacifica Law Firm gave the city a special municipal rate, and agreed to a fee cap of $600,000 in defending the income tax case. Filing numbers have also taken center stage in the city attorney debate, with Lindsay criticizing the incumbent for a substantial decrease in the number of cases being prosecuted. While the two find agreement over Holmes’ decision not to prosecute DWLS 3 cases (driving with a suspended license in the third degree, which Holmes referred to as “driving while poor”) Lindsay said the number of criminal non-traffic cases have dropped to under 6,000 in 2016, down from almost 10,000 when the incumbent took office. In particular, the challenger took aim at how the city attorney’s office has handled domestic violence cases, saying only a tiny fraction have resulted in “some accountability,” for the offender. Holmes, however, insists there’s much more to it than filing rates, which he called “one-tenth of the story.” The incumbent said he inherited a system where every domestic violence arrest was filed, with three quarters of them dismissed because of recanting victims, among other issues. Even now, he said, there’s been a 30 percent increase in reluctant witnesses that must be subpoenaed. He pushed back on the notion that his office isn’t adequately addressing the issue, and noted that more domestic violence cases are going to trial, and that there’s been a 25 percent increase guilty verdicts. “We’ve been trying the right cases, and we’re trying them even though we don’t have victims on board frequently,” he said. Holmes also said that in many instances, what a police officer has filed as a misdemeanor domestic violence case should have instead been classified as a felony. To send those cases to the county, he said, his office has to decline them. “It looks like, ‘Oh no, you’re walking away from these,’ and nothing could be further from the truth,” he said, mentioning that county referrals are up approximately 20 percent. The incumbent also said the firearm surrender program, which now has funding from both the city and county, has helped get weapons out of the hands of those who have been ordered to surrender them. He wants to address a criminal justice system he calls “a rudderless ship,” by bringing a systems-oriented approach to the position. Lindsay insists he is not trying to criminalize homelessness, but instead wants to break those struggling with addiction and engaged in criminal activity out of that cycle, and believes that begins with encouraging coordination between “incredibly siloed” groups of behaviorial health specialists, first responders, and the criminal justice system. Holmes, however, stands by his his efforts and filing decisions, and said from the beginning of his first term he told the Seattle Police Department he would not participate in a codependent relationship with police in issuing arrest warrants for those who are homeless, mentally ill, chemically addicted, without any demonstration of what the underlying issues are. What that mindset has done, he said, was force agencies, service providers, the human services department, and city executives to get to the front line of addressing those underlying causes. That said, Holmes doesn’t believe he has ever felt a greater need to serve another four years in his position. He said he has brought stability to city hall while working under four mayors, four police chiefs, an four fire chiefs, and once the election is certified in November, more than half of the City Council will be serving their first term in office. Ultimately the incumbent believes the city law department is functioning better than ever, and praised a newfound efficiency that came with the consolidation of the office in one location (the Columiba Center) after being scattered across six floors of three separate buildings. That has made the civil side of the department more primed that ever to defend the city and initiate lawsuits to advance city goals, with Holmes noting the suit against Monsanto on PCB pollution, among others. He also feels he’s now able to leverage all parts of the department’s 100-plus lawyers, counting among his successes a suit against West Seattle residents who had illegally cut a large swath of trees on city-owned land to protect their views. “In eight years, I’ve accomplished what I set out to do and more, but along the way also learned better how this position really works, and how to really leverage it into achieving outcomes that you want,” he said. To learn more about Holmes’ campaign, go to www.holmesforseattle.com. For more information about Lindsay bid, visit www.scottforseattle.com. To comment on this story, write to QAMagNews@nwlink.com.